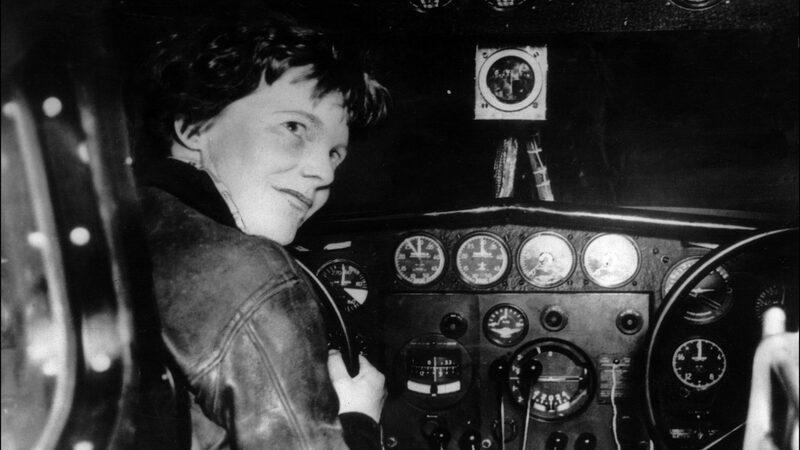 Although Earhart’s convictions were strong, challenging, prejudicial, and financial obstacles awaited her, but the former tomboy was no stranger to disapproval or doubt. Defying conventional feminine behavior, a young Earhart climbed trees, “belly slammed” her sled to start it downhill, and hunted rats with a .22 rifle. She also kept a scrapbook of newspaper clippings about successful women in predominantly male-oriented fields, including film direction and production, law, advertising, management, and mechanical engineering.  After graduating from Hyde Park High School in 1915, Earhart attended Ogontz, a girl’s finishing school in the suburbs of Philadelphia. She left in the middle of her second year to work as a nurse’s aide in a military hospital in Canada during WWI, attended college, and later became a social worker at Denison House, a settlement house in Boston. Earhart took her first flying lesson on January 3, 1921 and, in six months, managed to save enough money to buy her first plane. The second-hand Kinner Airster was a two-seater biplane painted bright yellow—Earhart named her newest obsession, “The Canary,” and used it to set her first women’s record by rising to an altitude of 14,000 feet. One afternoon in April 1928, a phone call came for Earhart at work. “I’m too busy to answer just now,” she said. After hearing that it was important, Earhart relented, though she thought it was a prank. It wasn’t until the caller supplied excellent references that she realized the man was serious. “How would you like to be the first woman to fly the Atlantic?” he asked, to which Earhart promptly replied, “Yes!” After an interview in New York with the project coordinators, including book publisher and publicist George P. Putnam, she was asked to join pilot Wilmer “Bill” Stultz and co-pilot/mechanic Louis E. “Slim” Gordon. The team left Trepassey Harbor, Newfoundland, in a Fokker F7 named Friendship (on June 17, 1928), and arrived at Burry Port, Wales approximately 21 hours later. Their landmark flight made headlines worldwide because three pilots had died within the year trying to be that first women to fly across the Atlantic. When the crew returned to the United States, they were greeted with a ticker-tape parade in New York and a reception held by President Calvin Coolidge at the White House. In 1937, as Earhart neared her 40th birthday, she was ready for a monumental, and final, challenge: she wanted to be the first woman to fly around the world. Despite a botched attempt in March that severely damaged her plane, a determined Earhart had the twin engine Lockheed Electra rebuilt. “I have a feeling that there is just about one more good flight left in my system, and I hope this trip is it,” she said. On June 1st, Earhart and her navigator, Fred Noonan, departed from Miami and began the 29,000-mile journey. By June 29th, when they landed in Lae, New Guinea, all but 7,000 miles had been completed. Frequently inaccurate maps had made navigation difficult for Noonan, and their next hop—to Howland Island—was by far the most challenging. Located 2,556 miles from Lae in the mid-Pacific, Howland Island is a mile and a half long and a half-mile wide. Every unessential item was removed from the plane to make room for additional fuel, which gave Earhart approximately 274 extra miles. The U.S. Coast Guard cutter ITASCA, their radio contact, was stationed just offshore of Howland Island. Two other U.S. ships, ordered to burn every light on board, were positioned along the flight route as markers. “Howland is such a small spot in the Pacific that every aid to locating it must be available,” Earhart emphasized. On July 2nd, At 10 a.m. local time, zero Greenwich time, the pair took off. Despite ideal weather reports, they flew into overcast skies and intermittent rain showers. This made Noonan’s favored method of tracking, celestial navigation, difficult. As dawn neared, Earhart called the ITASCA, reporting “cloudy weather, cloudy.” In later transmissions, Earhart asked the ITASCA to take bearings on her. The ITASCA sent her a steady stream of transmissions, but she could not hear them. Her radio transmissions, irregular through most of the flight, were faint or interrupted with static. At 7:42 a.m., the Itasca picked up the message, “We must be on you, but we cannot see you. Fuel is running low. Been unable to reach you by radio. We are flying at 1,000 feet.” The ship tried to reply, but the plane seemed not to hear. At 8:45 a.m., Earhart reported, “We are running north and south.” Nothing further was heard from her.